Manchester United manager Jose Mourinho says his side were denied a "clear penalty" after they laboured to a goalless draw against a resolute Southampton at Old Trafford. Referee Craig Pawson did not award a spot-kick when the ball struck Southampton defender Maya Yoshida on the arm in the first half. United were then unable to break the visitors down as their winless Premier League run stretched to three games. It means Mourinho's side will head into 2018 in third place after Chelsea beat Stoke 5-0 earlier in the day, while Manchester City have the chance to increase their lead to 16 points when they visit Crystal Palace on Sunday. Asked if it was a frustrating afternoon, Mourinho said: "Especially the minute the referee didn't give a clear penalty. "We played enough to score goals, of course we missed easy chances. But I am really unhappy with the penalty. Not with Craig's performance overall, but with the penalty. I think Craig had a game without problems, but it is a big decision." Yoshida admitted he was fortunate not to be penalised, saying: "Sometimes we get decisions from the referee and sometimes we get bad luck from them. Today we got good luck." Striker Romelu Lukaku was taken off on a stretcher for the hosts in the first half, having earlier headed a good chance over the bar. Paul Pogba did have the ball in the net for Mourinho's side late on, but his effort was ruled out for offside. But Southampton also had opportunities to win the game. Goalkeeper David de Gea somehow managed to guide Shane Long's effort over the crossbar with his foot from Saints' best chance. Mauricio Pellegrino's side have now gone eight games without a win since the 4-1 thrashing of Everton on 26 November. Mourinho spoke at length before Saturday's game about how Lukaku was suffering from fatigue, having played every minute of the club's Premier League campaign. The Belgium striker was again chosen to lead the line at Old Trafford, with the Portuguese saying "I cannot rest him". After beginning his United career with 11 goals in 10 games Lukaku has netted only four in the last 19, and headed over a good chance from Juan Mata's inviting cross after just three minutes. But that would be the 24-year-old's last involvement, with the striker clashing heads with Southampton defender Wesley Hoedt and having to be taken off on a stretcher. 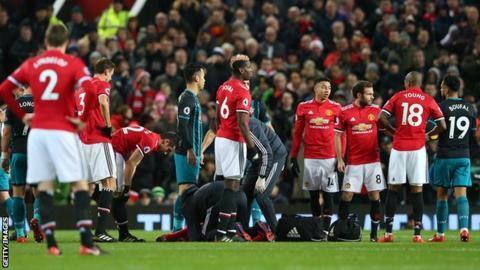 It was a concerning sight for Mourinho and Manchester United with the game stopped for five minutes as the medical team kept the forward on the pitch before moving him. Lukaku, who remained conscious, departed to applause from both sets of supporters. "Money" has been the word on Manchester United boss Mourinho's lips recently, with the Portuguese insisting the club cannot compete with Manchester City's spending. He also asked journalists to question Liverpool manager Jurgen Klopp over his 2016 threat to quit the game rather than spend inflated transfer fees, after the Reds agreed a £75m deal to sign Southampton defender Virgil van Dijk on 1 January. A United starting XI assembled for £378m failed to break down Southampton, even without the soon-to-be world's most expensive defender Van Dijk. Lukaku's chance was probably the best of the first half, but Mata also forced a save from Alex McCarthy - replacing the dropped Fraser Forster in the Saints' goal - and Jesse Lingard glanced a header wide when in a good position. Pogba then poked in from close range from an offside position late on, but United offered little without the threat of Lukaku, while striker Zlatan Ibrahimovic was not named in the squad because of injury. Marcus Rashford was the man chosen to replace Lukaku, and it was he and another one of United's academy products, Lingard, that looked most likely to create something among a team of expensive names. But Southampton had the nous to deal with the pace and trickery of United's youngsters, picking up an important point in the process. Few would have expected Southampton to come away from Old Trafford with a victory, despite doing so on two of their past three visits, and even though they increased their winless run to eight games it was a well-earned point for Pellegrino's side. Having shipped five goals in a defeat by Tottenham at Wembley on Boxing Day, the visitors had clearly addressed their defensive issues and put in an assured performance. Yoshida and Hoedt, with young full-backs Sam McQueen and Jack Stephens outside them, marshalled a well-organised back four that allowed United few chances. There were signs of encouragement for the visitors going forward, too, with James Ward-Prowse forcing De Gea into a save in the first half and Long seeing his effort turned over after the break. United's frustration was clear, with Ashley Young appearing to elbow Dusan Tadic in the stomach when marking the Saints midfielder. However, this run makes grim reading for Southampton fans, with the side suffering their longest streak without a victory since the 2004-05 season, in which they finished bottom and were relegated. The south-coast outfit sit 13th, but are just two points above the relegation zone heading in 2018 and how they reinvest the £75m they are set to receive for Van Dijk in January could well determine how they fare next year. Pellegrino says Southampton already have targets in mind. "It's good because we have our targets," he added. "We have a couple of targets we'd like to bring in, but with the transfer market you never know what's going to happen." Southampton's defensive display was impressive, and sitting in front of the back four was Pierre-Emile Hojbjerg. The former Bayern Munich midfielder made more tackles (five) and gained possession more times (13) than any other player on the pitch. He also made a game-high 68 passes, 91.2% of which found a team-mate. Manchester United manager Jose Mourinho: "I think it is also a disappointing afternoon for Craig [Pawson, the referee] because he's a fantastic referee, one of the best in Europe. "I'm happy with the players' attitude, the players' desire and I'm very happy with my place." Southampton manager Mauricio Pellegrino: "We were solid and we had our moments in the game. United had moments where they were uncomfortable on the pitch and we played really well. "We can use this performance as an example for the next game. Today I think our positioning was good and we did very well." Manchester United are now winless in four competitive matches, their worst run since May 2017, when the fourth game in that run was also against Southampton. This match ended a 20-game scoring run for Manchester United at Old Trafford in all competitions - they last failed to score at home on 1 April against West Brom. Southampton have lost just one of their last five trips to Old Trafford against Manchester United (W2 D2 L1). This was the 16th time in Southampton's last 33 competitive games that they have failed to score. Since Jose Mourinho's first game in charge of Manchester United in August 2016, the Red Devils have won 113 points from 59 Premier League games - fewer than Chelsea (138), Man City (136), Spurs (123) and Liverpool (117). Arsenal have played a game less (58) and have won just one point fewer (112). Manchester United visit Everton on New Year's Day in a 17:30 GMT kick-off, while Southampton host Crystal Palace on Tuesday (19:45). Match ends, Manchester United 0, Southampton 0. Second Half ends, Manchester United 0, Southampton 0. Attempt blocked. Marcus Rashford (Manchester United) header from the centre of the box is blocked. Assisted by Ashley Young with a cross. Attempt blocked. Jesse Lingard (Manchester United) right footed shot from the centre of the box is blocked. Assisted by Juan Mata. Attempt missed. Sam McQueen (Southampton) left footed shot from the left side of the box misses to the right. Attempt blocked. Sofiane Boufal (Southampton) right footed shot from the left side of the box is blocked. Assisted by Sam McQueen. Offside, Manchester United. Nemanja Matic tries a through ball, but Paul Pogba is caught offside. Attempt blocked. Nemanja Matic (Manchester United) left footed shot from the centre of the box is blocked. Corner, Manchester United. Conceded by Jack Stephens. Attempt blocked. Marcus Rashford (Manchester United) right footed shot from the centre of the box is blocked. Assisted by Anthony Martial. Attempt missed. Dusan Tadic (Southampton) left footed shot from the centre of the box misses to the left. Assisted by Shane Long. Corner, Southampton. Conceded by Nemanja Matic. Attempt missed. Dusan Tadic (Southampton) header from the centre of the box is too high. Assisted by Sofiane Boufal with a cross. Attempt missed. Nemanja Matic (Manchester United) left footed shot from outside the box is high and wide to the left. Assisted by Ashley Young. Corner, Manchester United. Conceded by James Ward-Prowse.